Still no answer to the charges of false eco-labelling! 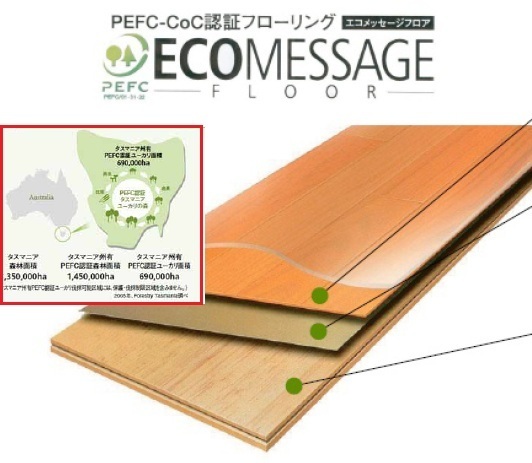 However, Ridley’s repost carefully ignored the central allegation of the report, which is that the eco-labelling on Ta Ann’s products is false, because Ta Ann Tasmania does not used plantation wood, as promised, but rather threatened old-growth forest. Rather than confronting this embarrassing matter, Ridley has chosen to focus instead on what he calls his ‘observations’ made during visits to his company’s HQ in Sarawak. Ridley’s fabulously rich boss, the Executive Chairman of Ta Ann, Hamed Sepawi, is of course the cousin of the corrupted Chief Minister Abdul Taib Mahmud of Sarawak and has received numerous licences, grants of public lands and state contracts, all without proper tender. The most interesting of these observations is possibly the last. Ridley kindly informs us, given that public information is so notoriously hard to obtain in Sarawak, that Hamed Sepawi’s Tan Ann has got its hands on a full 30% of all the vast areas of plantation licences that have been handed out by Taib over recent years! 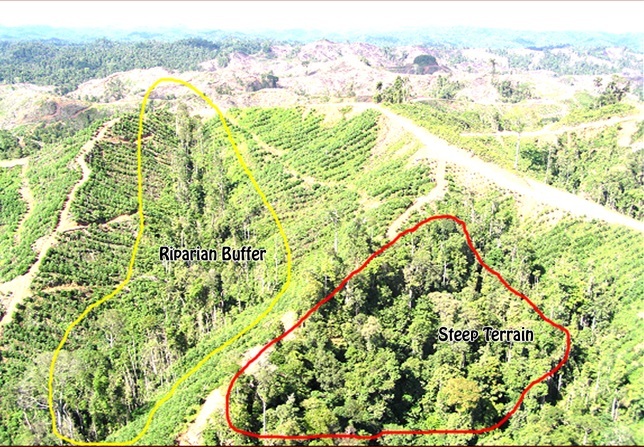 This is even more astounding when you take into account the fact that Ta Ann has been making such a big deal of the fact that it divested its former ownership of the largest of these plantations, Grand Perfect, just a year or so after Taib had handed it to a consortium of three of his crony timber allies, Ta Ann, Samling and KTS. We then exposed that the 30% share of Grand Perfect, the largest acacia plantation in South East Asia, which has controversially taken over huge swathes of native customary lands, was in fact diverted through a highly questionable secret deal into the personal ownership of Ta Ann Executive Chairman Sepawi himself! So,perhaps David Ridley can tell us what proportion of Sarawak’s plantations are managed by his boss Hamed either through Ta Ann or Grand Perfect? Might we be getting to nearer 60% of the state’s millions of hectares of projected acacia plantations…. or even more? Meanwhile, Ridley’s main self-justfication over Sarawak is that Ta Ann is felling rainforest that has already been cut down once before by Taib and his relatives. He appears to think that because Ta Ann is eradicating secondary jungle there should be no concerns. 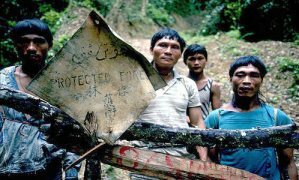 What forest is protected in Sarawak? Lets face it only 5% of Sarawak’s primary jungle remains and Taib’s loggers are currently bullying indigneous Penan blockaders who are trying to preserve it. 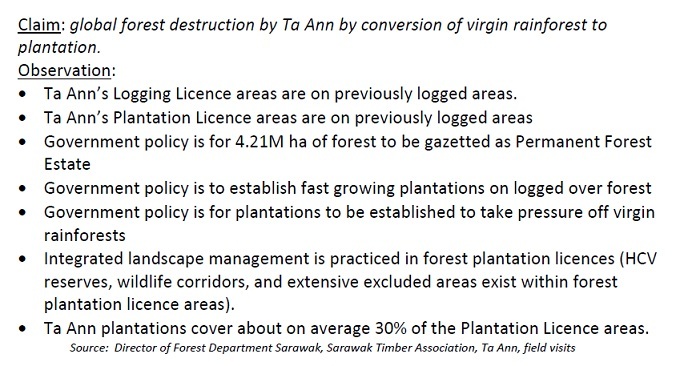 So under Ridley’s rules the WHOLE of Sarawak could become a Ta Ann plantation! Given this standpoint it has to be bad-timing for Mr Ridley that the Dutch appeal process has just found in favour of the NGO Greenpeace’s complaint that Malaysia’s wood certification scheme is below the acceptable world standards and should not be recognise as a badge of good practice! This means that the Dutch will ban wood products certified under the Malaysian Timber Certification Scheme (MTCS). 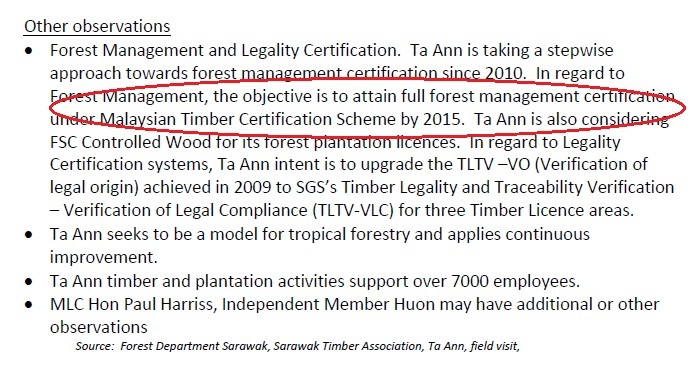 Unfortunately, this is the self-same Malaysian Timber Certification Scheme that David Ridley holds up in his ‘observations’ as the proud target that Ta Ann aspires to achieve in Sarawak! Although, he is forced to admit the company has not even yet reached that dubious standard and does not aim till till 2015! Therefore, Ta Ann falls beneath what the Dutch have already ruled as unacceptable. So, what confidence should the rest of us to have in Mr Ridley’s complacent ‘observations’ in favour of his corrupted boss and his plantations taken from state and native lands? Leaning on political support back home – perhaps Independent MP Paul Harriss can add his comments in support of Ta Ann’s actions in Sarawak? In his ‘Observations’ Ta Ann’s David Ridley invites Independent Huon Valley MP, Paul Harriss to add his own comments on the subject of Ta Ann’s ‘good practce’ in Sarawak (see above). It is an interesting request and Sarawak Report is interested to know what qualifications and insights this Tasmanian MP has acquired in the matter and how? Most particularly, can Mr Harriss’s judgements be held up as independent, objective and well-informed? 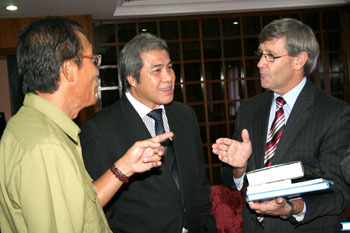 Mr Harriss is known to have travelled to Sarawak on some three occasions recently. Last year he went there in the company of Mr Ridley and visited a Ta Ann factory. Paul Harriss’s ‘Tasmanian Government Mission’! Intriguingly the Borneo Post (a Taib-controlled publication) described the visit as “a Tasmanian Government Mission”! However, Mr Harriss has answered queries on the matter back home with an assurance that he was merely ‘on holiday’ and paid all his expenses himself! “Tasmanian Government Mission” – but the besuited Mr Harris has told folk back home it was a holiday and he paid for it himself! On this ‘mission’ Mr Harriss was photographed by the Borneo Post with none other than Taib’s two top henchmen, Forest Chief Len Talif Saleh and Planning and Resources Minister Awang Tenggah. Not long afterwards Awang Tenggah was over in Tasmania sealing a major deal for Hydro-Tasmania’s involvement in Taib’s controversial mega dam projects. 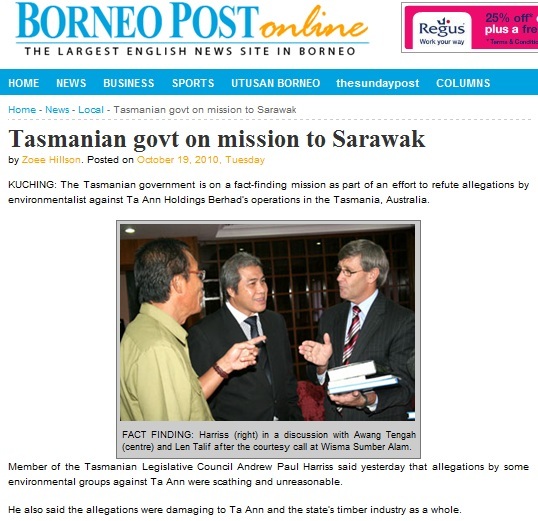 The objective of Mr Harriss’s mission, as described by the Borneo Post is also intriguing, in that he is described as being there to conduct a fact finding mission “as part of an effort to refute allegations by environmentalists against Ta Ann Holdings operations in Tasmania”. “It’s fair to say that some environmental groups in Tasmania have been unreasonable and too critical of Ta Ann and they have tried to bring that back to forest practices in Sarawak. Under the circumstances Sarawak Report would like Mr Harriss to confirm whether indeed this visit was merely an unpaid for holiday or indeed a Tasmanian Government Mission, as described in the Borneo Post? If it was a holiday, is conducting public political meetings and fact finding missions of this nature the form of recreation he usually seeks and belives to be appropriate? Certainly, given the nature of his quoted remarks it would appear that Mr Harriss had firmly chosen the side he would be batting for well in advance of his fact finding and was not in the business of arriving at objective conclusions! Eco-lies – when is Ta Ann going to answer the questions about these untrue ads promoting their product? Having explained himself, could Mr Harriss proceed to set the record straight in either Sarawak or back in Tasmania, where the government does not appear to have been informed that he was representing the state in such a highlyunusual manner for an independent MP? While we await answers on this delicate matter, we feel confident in advising readers of Sarawak Report that Mr Harriss’s ‘observations’, should he choose to take up David Ridley’s offer, should not be treated as either objective or unbiased. Mr Paul Harriss has made it perfectly clear he has no intention of recording facts that might reflect badly on Ta Ann, its boss Hamed Sepawi or the the highly corrupted regime of Sarawak with which both are inextricably linked. Whether Harris paid for the trip himself or he was brought over by Ta Ann, if he was hosted and feted by the gov’t ministers then of course he would get the gov’t line and only gov’t-supportive “facts”.